Ingham County Circuit Court Judge Rosemarie Aquilina will not be charged with obstruction of justice. Clinton County prosecutor Charles Sherman told FOX 47 News on Tuesday he has decided not to authorize charges. Sherman was appointed to the case after Ingham County prosecutor Gretchen Whitmer recused her office from the investigation. The request for charges was brought by Ingham County Sheriff Gene Wriggelsworth. He wanted Judge Aquilina charged because she allowed a reporter to watch and record video of a knife attack that happened in another judge's courtroom on August 2 of this year. 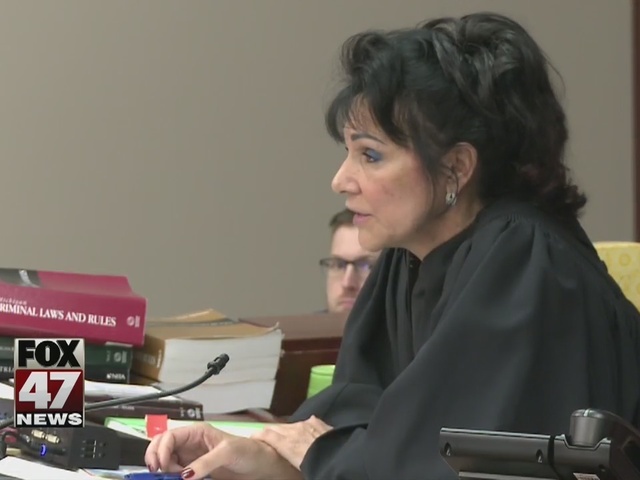 Judge Aquilina filed a lawsuit against Sheriff Wriggelsworth and Ingham County Detective Charles Buckland last week after word of the obstruction investigation surfaced. Her lawsuit claims Wriggelsworth and Buckland were retaliating against her for releasing the video and for refusing to recuse herself from an employment-discrimination case against the sheriff's office. The suit also accuses the defendants of invasion of privacy for falseley portraying her as a felon and for knowingly giving false information about her to the media and to other government agencies. The suit seeks at least $50,000 in damages.